The French country Trestle Table is known for it's sturdy design and flexible seating options without the impediment of table legs. The table has a double pedestal base with a center stretcher for strength, a 1 3/4" thick top, and (2) 15" extensions. Select "Aged Finish All Over" if you selected an Aged Finish under "Color"
A Trestle Table is a popular European dining table found in beer halls and restaurants for fostering lively conversation. The Trestle Table is also known for it's sturdy design, and flexible seating options without the impediment of table legs. 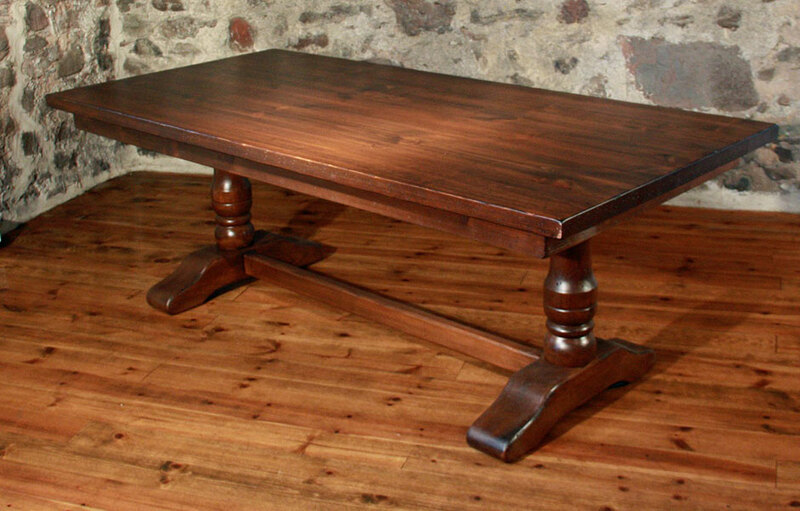 Our Trestle Table boasts all those attributes with an elegant French Country design. 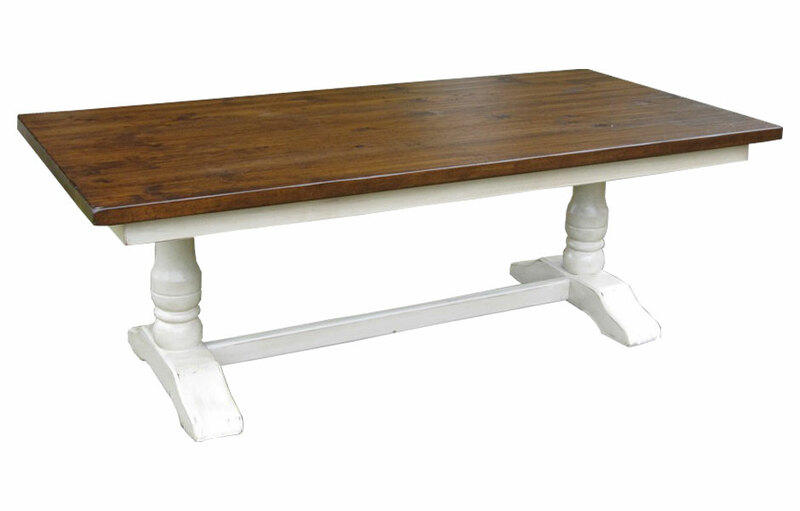 The hearty, hardwood turned legs of the trestle adds French elegance to any dining room. The rustic, 1 3/4" thick top is cleanly framed by a generous skirt around the table. The two contoured trestle bases are connected by a crossbar for stability and ease of seating without the impediment of table legs. The trestle top is a thick 1 3/4" and has (2) 15" company board extensions to lengthen the table for large gatherings. The addition of the company boards gives the table (4) additional seats for guests. 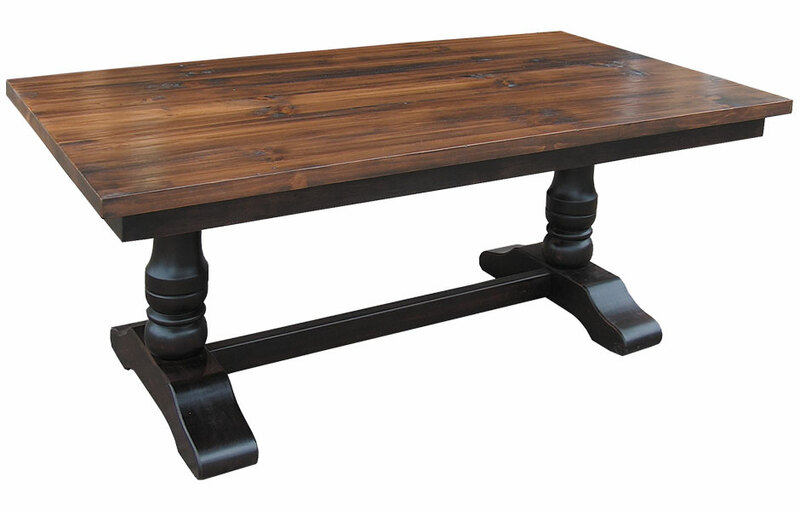 The Trestle Table can be paired with the sturdy Trestle Bench for rustic bench seating. 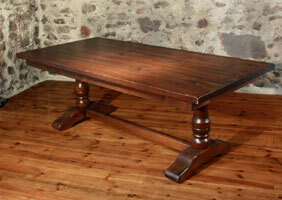 Or, add French style to the table with wheatback, ladderback or any of our dining chair options. The Trestle Table features solid hardwood turned trestle feet joined by a crossbar for enduring strength. 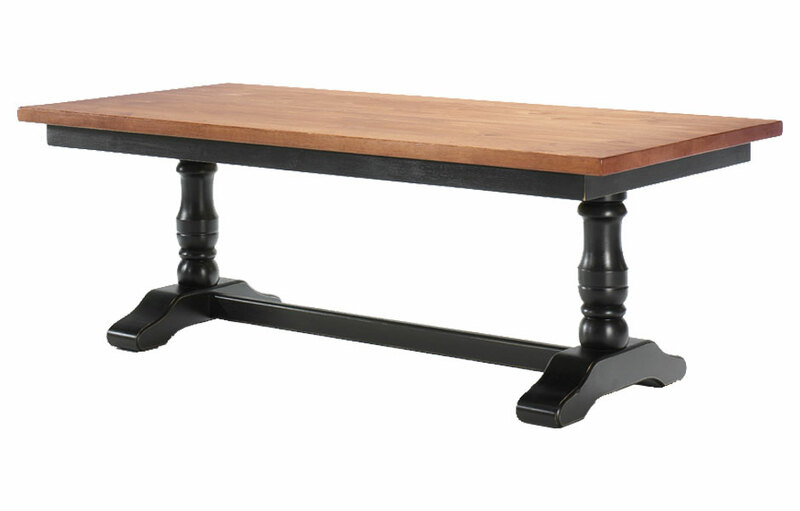 This Trestle Table is available in standard lengths of 60-inches (5ft. ), 72-inches (6ft. ), 84-inches (7ft. ), and 96-inches (9ft.) but can be customized to any length of your choice. 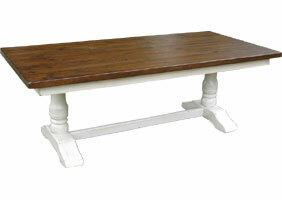 The Trestle Dining Table can be finished in a classic two-tone French country paint and stain. Or, finished in one all-over stain or paint finish. This French country Trestle Table complements French Country, English Cottage, Farmhouse, Rustic, Transitional and Traditional style decors. We deliver throughout the US offering a White Glove Delivery service. *Some areas of Canada may be covered. Shipping & Delivery. Orders take 8-10 weeks to build, finish, and deliver. In some cases we can meet tighter deadlines. Need it faster? Please email cs@katemadison.com or use the Have A Question! form. All the finishes that we offer on our furniture are uniquely French Country. We offer traditional milk paint finishes and low VOC stains that are healthy for you and the environment. All finishes are hand applied, then lightly rubbed for time worn character. Our "Aged Finish" stains are achieved with multiple coats of stain followed by the application of a glaze. Our finishers lightly surface distress tops for a time worn appearance. All finishes are water sealed and waxed for easy care, everyday use. Do you have a question on this item? If we haven't covered everything you need to know we will be happy to provide an answer for you! Please email cs@katemadison.com or use the Have A Question! form. Need this item customized? We can build it in a size or configuration that fits your home! We'll need to know what your size needs are and any customizations you are thinking of doing. With those details we can provide more information and pricing on making a custom piece of furniture for you. Please email cs@katemadison.com or use the Have A Question! form. We offer (4) styles of tops on all of our furniture: Stained Pine, Hand Planed, Birch, and Vintage Pine. You choose the table top that fits your style of table. Our Aged Finish tops are also available, these colors are Caramel, Sequoia, and Tuscan Sunset (see above color links). Aged Finish tops are achieved with a stain, glaze and surface distressing. "Stained Pine" is our standard solid wood top featured on all furniture pieces. "Hand Planed" is a Stained Pine top which has a planed down surface to open the grain of the wood to allow a deeper stain color. This technique provides an uneven, grooved surface for a more rustic look. "Birch" is a hardwood top that has less wood grain and no knots when compared to Pine. Birch is a popular choice for customers looking for a harder top for children or heavy wear.